Please note: that the way benches can be fixed to the floor is not as indicated in the photograph of the bench, the becnhes can be floor fixed using the adjustable floor bracket shown in the close up photograph. What is the purpose of the changing room bench? Designed for schools, but suitable for day cares, sport clubs, gyms and more, this bench can be used for boys and girls aged 2-5 and 6+. 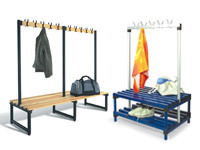 It offers clothes hooks, sitting bench space and mesh compartments for footwear. It is available in 8 sizes, able to accommodate from 8 to 36 users, with three colour options for each size: silver, blue and black. Durable and easy to set up, it is a great space and money saving solution. Where can this bench be used? This changing bench is perfect for any institution or formal or informal organisation developing activities that require their participants to change clothes. 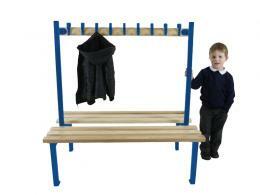 It can be used alone or in combination with lockers or shelving units. The double sided design optimises space use and encourages communication between children, and the hooks and mesh compartments facilitate the convenient storage of both clothes and footwear. Any public or private institution organising activities dedicated to children can benefit from using these benches, as they are affordable, durable and safe. They are easy to use and they can be fixated to the floor for improved safety and durability. The bench is available in 8 lengths ranging between 900 and 3000mm, with 1250mm height, 750mm depth and 400 mm seating height. 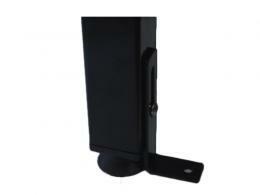 Its 38mm x 38mm steel frame is coated with a polyester powder finish for improved durability. The coat hooks are made from a durable plastic that matches the colour of the frame. The hardwood slats of the seating bench are 70mm wide and 32mm thick, providing both resistance and comfort. The unit is very easy to assemble. The product is subject to the Workplace Depot’s promise to match any lower price you find with a competitor. It includes a 1 year warranty for both parts and labour and it can be delivered to any part of the UK. The customer friendly return policy is just another guarantee for the quality and reliability of this changing room bench. Order it now and get a taste of the high-quality products and services that only Workplace Depot provides!